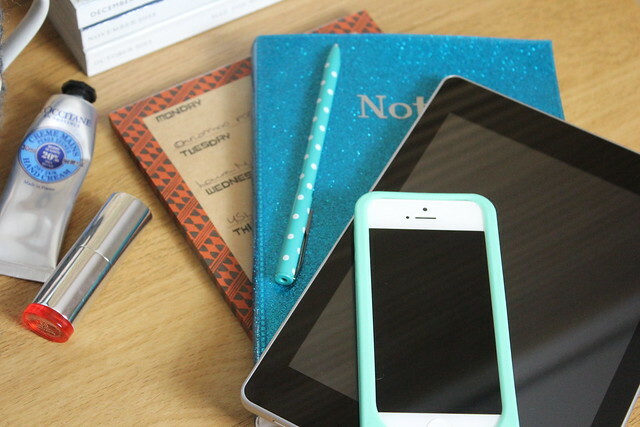 I know not everyone reading this is a blogger, but I know that there are a few out there and I hope that this might be a bit useful – blogger or otherwise as the tips on trying to stay organised can apply wider than just us blog-loving people! But having blogged pretty much daily for coming up to five years – whilst also having a full time job to do – I have had to learn pretty quick how to get and stay organised. I don’t just mean with posts, I mean juggling all aspects of blogging life – and ‘real’ life away from the computer screen. I’m by no means perfect at being organised, my inbox is often over flowing and I don’t always get my blog life/real life balance right – but I have learnt a few tips along the way that I wanted to share. I live in a flat in central London, so space is at a bit of a premium. Until fairly recently when I persuaded the boy I *needed* a desk space I had to just make my blogging space wherever I decided to sit with my laptop. But I did find that this could get chaotic – sitting surrounded by notes, beauty products, camera kit… so I did start to set up my own little ‘space’ for blogging and it really helped. I used to just use a blank area on a side board, which I knew would be clear to take photos. Then sit on the bed to do the actual writing part. Making my space made a real difference – not only to feeling organised – but also to keeping photos consistent as the background remains the same. I have now been very lucky and basically made the spare room in our flat into my blogging space, but this did take about three years of persuading (it was previously a bit of a man-cave) and whilst it has made a world of difference to how organised I feel, I know this isn’t an option for all. Not just because I’m a sucker for a pretty note-book, but it definitely helps keep you organised. I keep multiple lists of things I need to keep track of (drafts to write up, products that are incoming, key info I need to remember) but most of all this is handy for noting down ideas for posts. I find that for a good chunk of the day (especially when getting ready in the morning for some reason) my mind is popping up new post ideas. Sometimes even starting to think about the opening paragraphs or what products would be included – so having a note book to hand is so helpful to note these down so they’re not lost in a flurry of inspiration. Beyond beauty, and storage solutions my other main love in life (oh, other than macaroni cheese and sausage dogs) is gadgets. I love a good gadget, and I am pretty much a total Apple/MAC convert with the iPhone, the iPad and the iMac in my life – but I have recently branched out. I wanted to get myself an iPad Mini, because it’s a more practical size tablet for carrying around on the go. But pre-Christmas and various other life things, it just isn’t an option to buy one now. But I was given the chance to do an Acer tablet review – which is pretty awesome. As I said, I am a dedicated Apple/MAC girl, but this ACER Iconia A1* tablet has come in so handy for keeping track of things on the go. It’s lighter weight feeling than an iPad and a little bigger than the iPad mini but is a good budget alternative as the functionality is really good and it’s amazingly easy to use. The thing I’m finding most handy about this is how easily is syncs up all my google accounts – so I can have my google drive on there and access some docs offline. Which means I can do some bits of bobs when on the bus or tube, without needing wifi. Making the most of otherwise ‘dead’ time that I’d probably just spend twittering or taking shameless selfies. Having a tablet can also be a good techie-alternative for the notebook when out and about – just make sure you have a list writing/note taking app on there and you’re sorted. This is the one I’m currently guilty of failing at a bit, so want to make sure I take a bit of my own advice here. But blogging is one of those ‘endless string’ type of activities, it’s never really ‘done’ as it’s something you’re producing from nothing, so can really end up taking an endless amount of time. I do constantly feel like I need more hours in the day and often find that other important areas of life can be sidelined – like spending decent time with my friends, boyfriend or family. Now the thing to note here is that it’s totally my choice to spend a lot of time blogging, I love it and absolutely love the time I spend on it – but sometimes it’s just as important to slob out on the sofa with your boyfriend without your laptop on your knee or phone in your hand. I tend to give myself a day or half a day at the weekend as my main blogging window, depending how many photos I have to take or blog posts I want to get written up. But give yourself a deadline for when you will switch off the old internet and go spend time away from the computer – makes for a far more interesting blogger overall! 5. Have regular clear outs! Any beauty-junkie knows that a beauty collection can easily start to get on the excessive side – I’m totally guilty of this. One of the biggest treats of blogging is getting to play with and try so many products – but the inner hoarder in me can be a bit of a nightmare with this. Yes, I adore that blush…but it’s a 99.9% identical copy of another in my collection, I definitely don’t *need* to keep them all. For the past couple of years I’ve been having regular clear outs, taking them into work and having a beauty sale there where the items are all sold on to loving homes and the proceeds donated either to Refuge (my personal choice) or to the charity being supported my work (currently Kid’s Co). Another alternative to pass on your maybe less-loved products is to donate to Give and Make-Up – a fantastic non-profit initiative that takes donations and passes them directly to support Refuge and Women’s Aid. Where even the most basic essentials of shampoo or toothpaste will mean the world. As I’m leaving my current job as of the New Year, going forward this is what I’ll be doing with any products that I want to pass on. A win-win, you can do a great thing for people who need and appreciate it AND get more organised in the process. I hope those few tips help you feel a bit more organised. Happy blogging! Thank you for sharing, and great blog by the way! I love reading posts like these as I am always learning. I agree about the blogging time, I have set times in the day to do things (and work full time like you) so I am ‘allowed’ to sit on the computer for a couple of hours after dinner doing my ‘work’ which I love so its enjoyable for me! Great post! I definitely want to become more organised in the new year when it comes to blogging, as it’s really taken a back seat as of late! Brilliant post, and they are great tips, I am exactly the same with notebooks (I keep one in my bag at all times). I write down a blogging plan in my Filofax so I can somewhat plan ahead at what needs to be written up, and photographed in time for the post. I am definitely guilty of procrastinating and if i’m at my boyfriends or he’s with me I tend to put off blogging, plus working in the daytime means I come home with no light for pictures. I really need to make use of the draft feature! This is such a great post! Followed you! Would you check out my blog too? Could defo use some tips for tidier organisation of it! Love this post, there are some really helpful tips in here. I go through phases where I spend loads of time on mine and others where I neglect it completely. I’ve been really busy recently so haven’t spent much time on my blog at all, but despite that I still feel guilty spending time on it at the weekend and not spending the time with my boyfriend. There needs to be a good balance! This is great advice. I recently had to have a break from blogging to take up two jobs but I’m slowly worming my way back to the blogging world. Organisation will be key and you’ve given me a little inspiration 🙂 Thanks! Great tips! I totally agree with you – it’s really important to have a set blogging time and time to just relax and not worry about it. It’s harder when you work full time too! good advice, i need to start doing some of these especially the blogging window.